Yesterday I met my friend, Tammy, for lunch to celebrate her birthday. We went to the Secret Garden Tea Restaurant in Kerrisdale. Tammy and I had a great time and lunch was delicious! It was also the birthday for another good friend of mine, Kelly, and we'll be celebrating her birthday (she's one of the crafty girls) next week when the four of us crafty girls go for High Tea at Applewoods in Delta. Again, happy birthday to Tammy and Kelly and hope you both had a wonderful day! On to the card for today. Today's challenge from SCS is "Free for All (F4A95) - Winter Flowers". I made a CAS card with Christmas Roses (Helleborus) using all SU! products. I used Crystal Effects on the jar to give it a 3-D effect, but it doesn't show very well in the photo ... definitely better IRL. Hope you like. I stamped the jar of flowers in Basic Black ink onto Whisper White cardstock and then heat embossed with black. 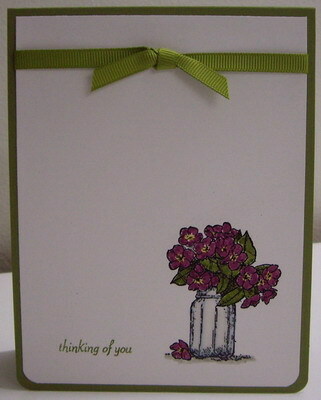 I colored the flowers with Stampin' Write markers (colored the centers first and then the outer part of the petals). I outlined the jar with Bashful Blue ... hard to tell in the photo :( ... and put a "shadow" under the jar with Sahara Sand ink. I covered the jar with Crystal Effects to make it 3-D. After letting the CE dry for an hour, I finished the card by stamping the sentiment in Old Olive ink. Tip: with small sentiment stamps, I find it better to ink the stamp with Stampin' Write markers. Otherwise, the small stamps tend to rock when you stamp them and you end up with extra lines on your cards. I wrapped the Old Olive grosgrain ribbon around the top of the card and tied a knot in the center, securing it with a glue dot. I rounded the bottom corners of the card front and then mounted it onto a card base of Old Olive (also bottom corners rounded).